Greetings and salutations, everyone; yes, once again it is I, Mani the purebred border collie, hunter of voles, filling in for the guy I live with, and here to bring you the latest news from our garden. You may remember me from such posts as “Mostly Iceless”, among so many, many others. Here I am in a characteristic pose. The old biscuit-on-the-head ploy, again. And not hugely in focus. It was a pretty nice day, considering. 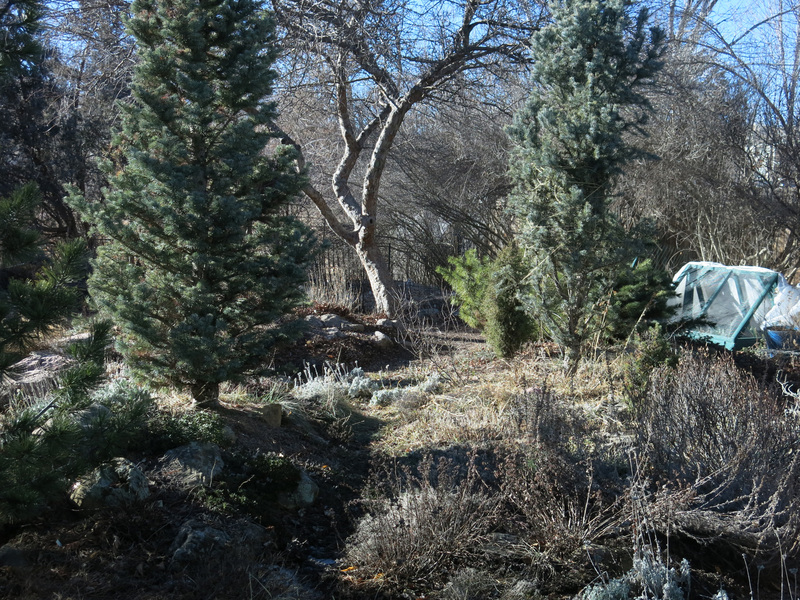 You can see how the little mugo pine ‘Carstens Wintergold’ kind of glows. The snowdrop frame was uncovered for a while today. 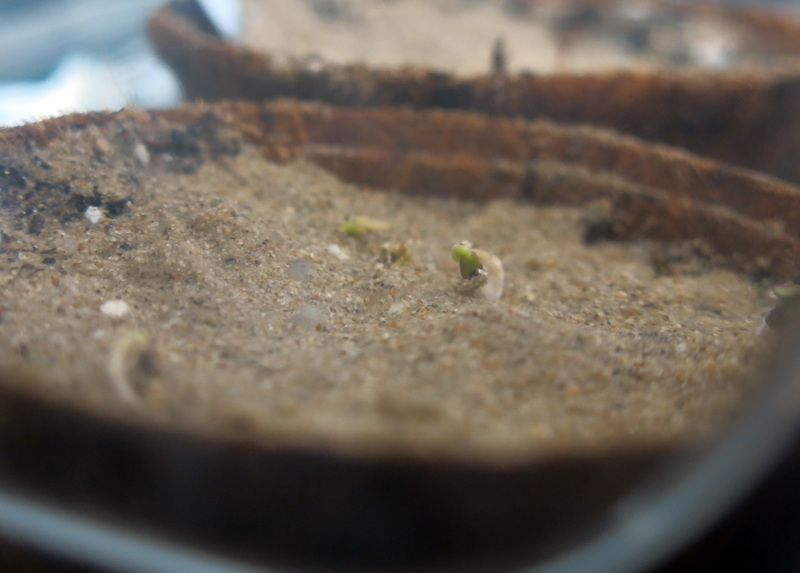 There are seeds germinating in the propagators upstairs. This is Poliomintha incana. 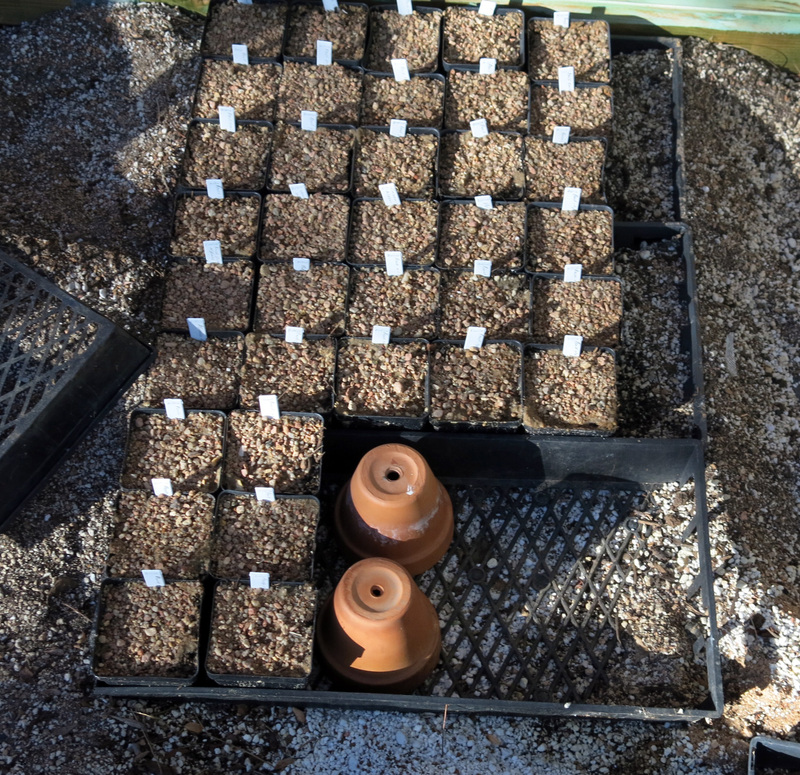 And all the seeds from Alplains, mostly penstemons, were sown and the pots put in the frame. The frame was supposed to have bulbs in it but still doesn’t. The guy I live with said he wasn’t going to order any seeds this year and he wasn’t going to do this and wasn’t going to do that, and just might spend the next several months just sitting in the chair he sits in, staring at the rug on the floor, but I kind of wondered if this wasn’t counterproductive. This is a difficult climate in which to garden, I think, and sometimes he does lose heart, but then keeps going despite things. So he ordered the seeds and when they arrived he seemed a bit excited, and started talking about how blue the flowers were, and how he envisioned maybe a slight slope on a hill somewhere in, say, northwestern Colorado, where penstemons grew wild, with the dark blue, almost black, bee-kissed flowers swaying in the breeze, and then he got this far-off look. I get that look too, but for different reasons. Anyway the seeds were sown and I started to look forward to bunches of blue flowers, like were here in the old days when a book was being written about them. I can see blue. One of the advantages of growing things from seed, if you were wondering, is that you can have plants that you sometimes can’t get from nurseries. 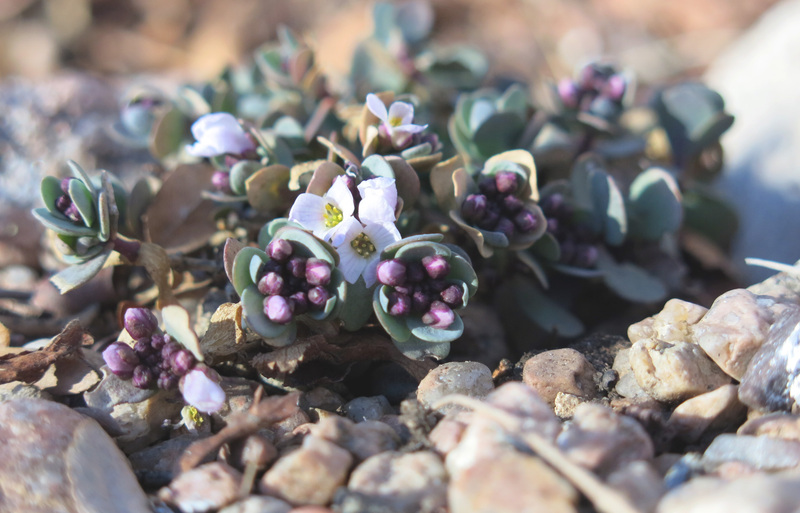 The little Aethionema oppositifolium was flowering today in the rock garden. (There are a couple in troughs, too.) This little plant is also known as Eunomia oppositifolia. I wondered about the gender agreement when I heard this; you know, Aethionema oppositifolium, but Eunomia oppositifolia, until the guy I live with said that the Greek ending –nema was neuter gender and so the specific epithet would take a neuter ending, -um. I was very glad to learn all of that, of course. It was seventy degrees today. About twenty-one Celsius. Seventy. And windy. Even super windy. If you’ve been following my blog for any length of time you will know that seventy degrees in winter means a sudden drop in temperature very soon after, and sure enough, the temperature tomorrow night is predicted to be four. Four. That’s minus sixteen Celsius, almost. So there is going to be a drop in temperature of almost seventy degrees in less than forty-eight hours. Really. I could hear a heavy sigh, every so often, coming from the kitchen, so I though it might be best to come into the kitchen and spend some time in my Kitchen Fort, close to the guy I live with, and all the sighing. I have to listen to a lot of this. 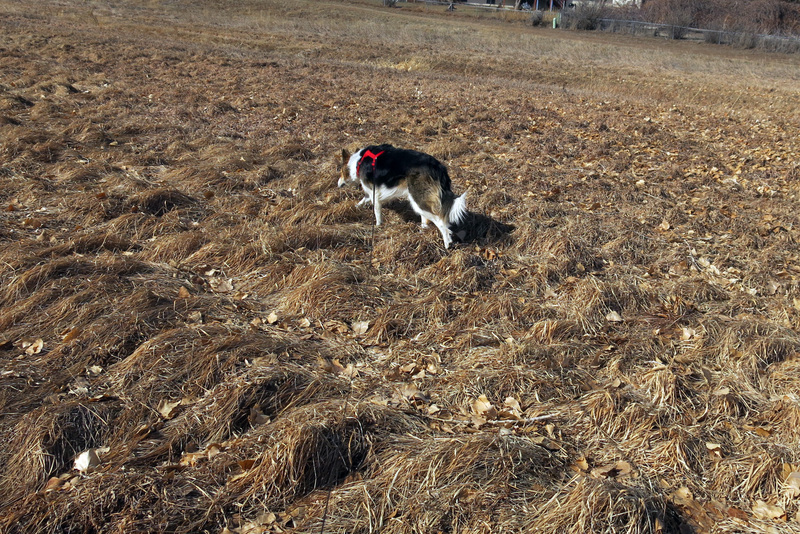 Maybe in exchange I get to do a lot more hunting for voles that I might otherwise do. Of course I’m not really allowed to do anything but just look. This is me just looking. 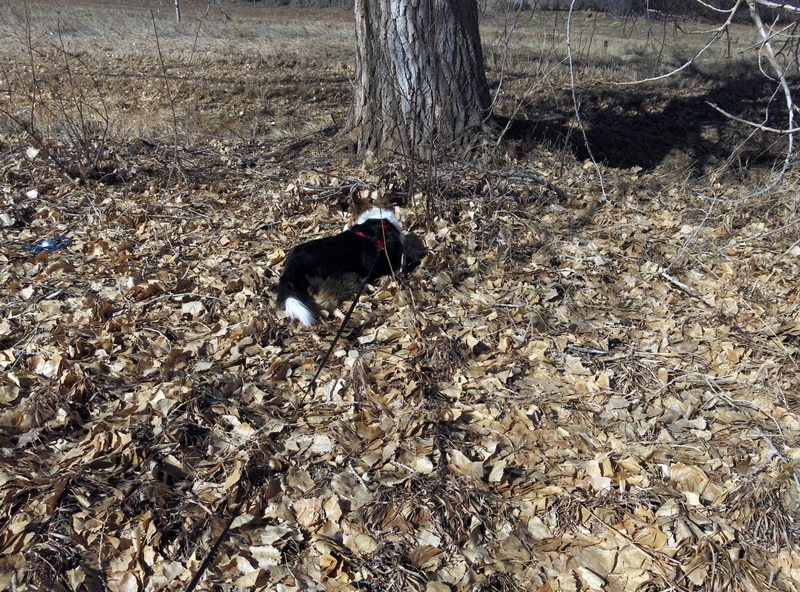 Here, by the cottonwood, I was certain that there was something lurking in the grass under the leaves. The guy I live with said he wasn’t just going to stand there while I lay on the ground waiting for a vole to show up. I can smell them, and hear them, but have never seen one. He said they were like big mice, and that maybe eventually I would see one. So that’s pretty much everything that’s been going on, plus the incredible drop in degrees we’re expecting tomorrow. 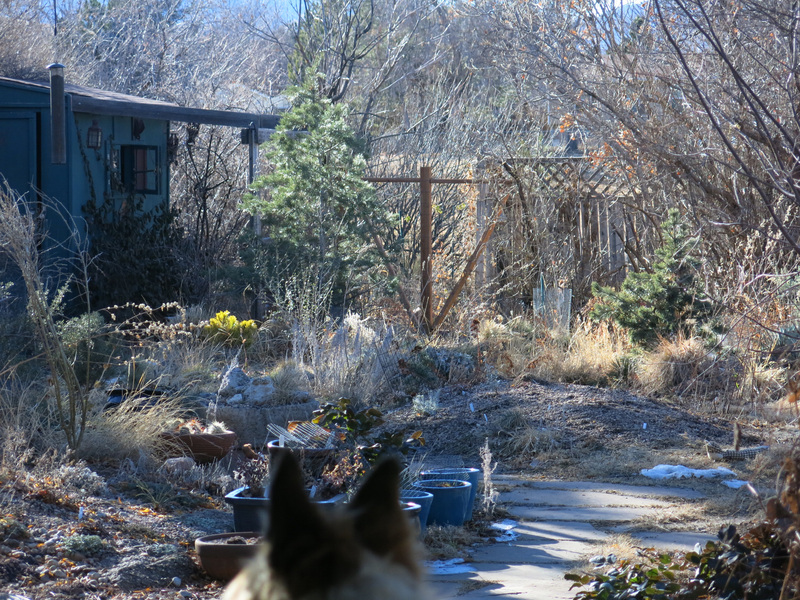 I could talk about how the wind is blowing plastic grocery bags all over the place, and how some are flapping in the branches here and there in the garden, but instead, I’ll leave you with a short film of me on my walk today, in the wind, by my own back fence. I still feel badly about telling Bill that the blue Blazer was a red Bravada now that I know that he knew it was blue all along. We can definitely see blue, and yellow too. Even though I can see blue I totally failed to mention the drone. It was first mentioned in “Shedding Light” back in December, when it was hung on the fence, but eventually disappeared. 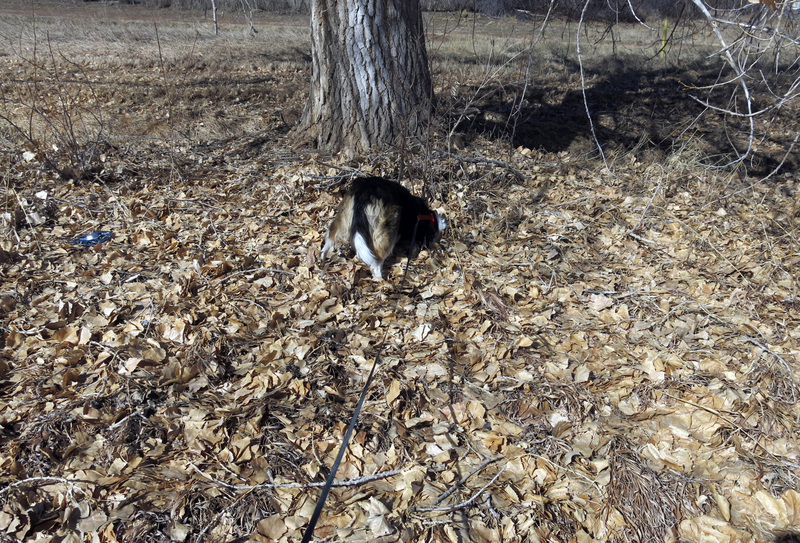 You can see where it wound up in the pictures of me lying by the cottonwood. I was going to say something in the post but forgot. What was it doing there? Those things are scary. Well, it was on the back fence, after we found it in our yard. Thought someone would pick it up, and they did, but left it under the tree. That is strange. Those things are not cheap. Did you happen to see the picture of the big moth that I posted on ‘Six on Saturday’? I thought it was pretty, but you might not like it. A few of them have been showing up. I think that they are mated, deposited their eggs, and just fell from the trees above to die. It is sort of sad to see something that pretty die like that. Privet, a small terrier whom I worked for in the 1990s was afraid of moths too. I hear we had some big moths like that here back in the last century. Cecropias or something similar. Yes that is what that one in the picture is. Do you know who Mothra is? I’ve never heard of Mothra, but the guy I live with remembers when the movie first came out. It is probably better that you are not acquainted with Mothra, since you dislike moths. He lives in Japan anyway. Whew, huh. There were cecropias here, according to the guy I live with, and his wife captured the caterpillars, put them in a specially-built cage, fed them, and protected them in the cage until they hatched into moths. But that was years ago, and no moths like that have been seen here since. I remember seeing them near Jackson (California) in the early 1970 when I was a little tyke, but nowhere else and never again. Now several fell out of the pondersa pines in just a few days. I do not know why they were in the pines. There are no tanoaks up there, although there are many in the neighborhood. Yeah. We don’t know much about bugs here. The lady of the house was the bug fan; about one thousand items from her collection are now at the Denver Museum of Nature and Science. Wow! That is cool! You know, it is very difficult to pin a flea. I’ve never tried, and we don’t really have fleas here. Ticks, sometimes. Ticks are not insects though. This crazy weather. We had snow yesterday, and are expecting arctic cold the next few nights. Poor early budding plants–who thought it was spring already. My daughter, Megan, and I went to a propagation lecture at Joy Creek this Saturday–along with garden bloggers from the area. The whole time I was thinking about my animals and how challenging it would be to get any thru to fruition. We went back to Megan’s for a wee meeting on plant lust logistics–and when we were done, some hour later, Megan’s pot had already been pilfered by a naughty kitty. I so admire you propagators and seed growers, but I’m not holding my breath on getting any done. Instead, I’ll be supporting local nurseries. 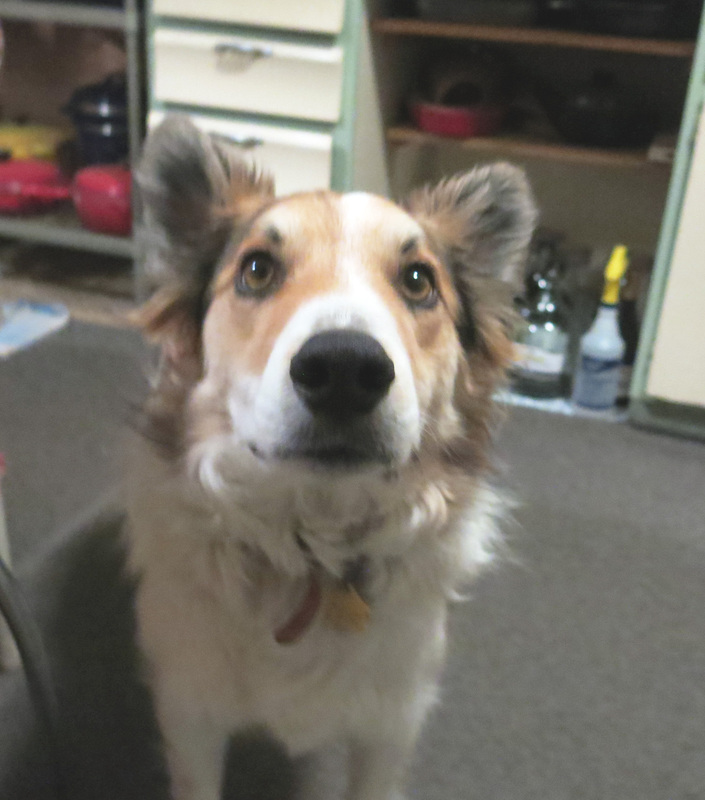 Well, we purebred border collies are not hugely known for destroying things like cats are. However ….I was reminded, rather forcefully, that when I was very little, I kind of walked all over the seed frame that was under the Cotoneaster multiflorus, in fact totally stomped on it. The seeds in the pots there were ones given to the guy I live with and will probably never be collected in the wild again. I know I should tell you more often, but I just love reading your blog. Hey Mani, I’m sighing too and we are going to be a balmy 18 degrees. So, if it goes down to 4 will you be able to dig for rodents or will the soil be frozen solid? Wait, it’s pretty dry, right? Does soil have to be moist to freeze solid? I think sowing a seed is so exciting that it makes up for the many disappointments and setbacks a gardener must suffer. You may not understand, but I know you understand optimism and that’s what seed sowing is. The soil does have to have water in it to freeze, but only some of it here is frozen. Where the crocuses would be, but not this year. The soil in the field is so covered with a thick mat of grass (smooth brome) that it’s not frozen, but I don’t really dig in the ground, I just look in the tunnels, which are mostly above ground. Like trenches where the top is the grass. It’s snowing right now. The guy I live with said, with a sigh,that that was good for the seed pots. So much sad sighing at your place, Mani. I’m sighing sadly too because here it is the 24th and I just discovered a posting from the 19th. I like your blog too if you didn’t know. I guess it is just too much to fix whatever intervened with email notification of new posts. Sigh. I love the seed pictures. I’ll sow some tomorrow. Today I put some natives into the ground, including plants that butterflies like. I do appreciate the live action bits starring YOU. Tell the guy you live with to take a book along on your walks so he can check plant nomenclature while you lie on the ground watching for voles. Thanks. We’re not sure why you don’t get notifications. Spent some time trying to figure this out, but maybe it’s some arcane WordPress thing. I guess we could contact support and see what happens. There has been a lot of sighing here lately. It snowed. The snow refuses to go away. The guy I live with says it’s like having a house guest who constantly talks about the same thing and never leaves. Voles are pretty interesting, if you didn’t know. I can just be walking along, and there’ll be some grass, and then something moves in the grass. I’ve never actually seen a vole but I would like to. Oh. I guess we also have a fox here. That sounds really exciting.